The Palladium World (from the Palladium site) is one of epic fantasy. It is a world torn in conflict with the non-human barbaric races, creatures of magic and supernatural forces. Non-Human playing characters provide a host of unusual creatures as regular characters. They include the feared changeling who can assume the shape and appearance of any humanoid. There are also the giant races of troll, ogre and wolfen. 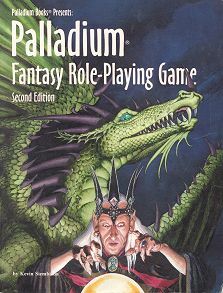 The small and agile goblin, kobold, gnome and the mighty dwarf, as well as elf, human, and dozens of “optional” creatures found in both the Palladium RPG and Monsters & Animals. Character sheets are found here. The skill system embellishes characters with knowledge and abilities that make him or her more than a simple fighter or mage. Combat is realistic, with strikes, parries, dodges and considerations for shields and armour. Yet it remains extremely quick and playable. An Experience System in which characters are rewarded for acts of ingenuity, ideas, cunning, discretion, trickery and bravery. Not hack and slash. Magic: Over 300 spells, plus elemental magic, circles, symbols and runes are yours to command. The most original forms of magic found only in the Palladium RPG are the Diabolist and Summoner. The Diabolist casts no spells, instead he uses the nearly forgotten magic of wards (mystic symbols) and circles of power. The Summoner too, is versed in the mystic arts of magic circle making, but his is a far more dangerous and often malevolent power, for he dares to summon and command creatures of magic. The wizard, warlock, priest and other more traditional characters also break away from their more common game molds, with a vast array of spells and abilities that make them truly unique. My first character, Jack Wylde, is a Diabolist; but more importantly he is a Detective, a Private Investigator. He investigates crimes in his waterfront town of Port Monivey. The crimes may be committed by normal and supernatural criminals. Port Monivey is a sort of medieval noir setting. Jack operates from his Diabolist shop and lives on the second floor of the shop. Between cases, he researches Wards and other symbols; making the occasional Ward of Protection for the locals. His Wards come in handy, to protect him and others from supernatural creatures. Jack is a freelance adventurer and fights crime with his associates. Tavara is a were-coyote, who is a partner with her two lady friends in the local bar, Coyote Ugly. She is a blue-eyed blonde, shapely, and deadly in either form. Thalia is a healer with Elvish features, tallish and attractive with brown hair and eyes; she is a ship-mistress with a mysterious background. Others join them in various cases. Jack is tallish, with steel gray eyes and dark auburn hair. Jack is constantly at odds with the local police, particularly the Inspector. He works with the underground elements, people unreachable by the police. Join Jack and his friends in their exploits. My second character, Katar Hol, is a Hsian Air Elemental Warlock. I haven't used in in a game setting yet, so we will see how it develops. The Hsian RCC was created by DaBeechMan. I wanted to develop a Palladium character like my original Winged Folk (Al Karak Elam) character from AD&D. This is the closest I was able to do so far. Join Katar in his exploits.